ALLEN FISHER is a poet, painter and art historian, website: www.allenfisher.co.uk. He has authored many publications of poetry, graphic work and commentary; recently: SPUTTOR, a book of the poetry, commentary and visual work (Veer Books 2014); The Marvels of Lambeth. Interviews & Statements, 1973-2005, edited by Andrew Duncan (Shearsman Books 2013); a collection of essays is forthcoming from the University of Alabama Press (2015). His visual work is in many collections in America, Britain and the UAE. In autumn 2014, Spanner Editions will publish TIP REGARD, a set of extracts from poetry in four projects. Allen is currently Emeritus Professor of Poetry & Art at Manchester Metropolitan University, one of Key poets at Voiceworks, Birkbeck College, University of London and Visiting Fellow at Northumbria University. 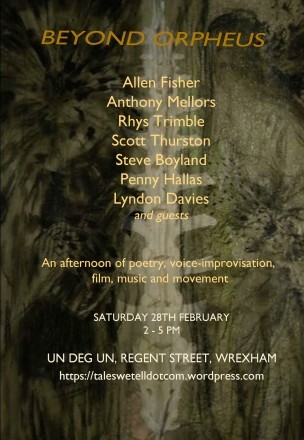 RHYS TRIMBLE is a Bilingual poet / performer based in Bethesda, North Wales originally from Pontneddfechan. An experienced performer/improvisor interested in medieval welsh language & bilingual poetry, music/poetry, collaborations, digital-art and avant garde writing practices. Recent work includes performances at Dinefwr Festival (click here to see it), Blinc Digital Arts festival, and Eisteddfod 2012 (click hereto see it), Aberystwyth Drwm as a member of prosiect Datgeiniaeth – Datgan cerddi penpastwn with Twm Morys, Gareth Sion and Peter Greenhill (http://stiwdiogwellt.com/album/awdl-i-ddewi). Editor of Ctrl+Alt+Del. Ezine and studying for a ‘psychomythogeographical’ PhD in creative writing.